Whether a new boat or an older one, boat maintenance is a key area that as boat owners we need to focus on. Given the harsh conditions, acid rain, UV, salt, marine organisms, fuel exhaust to name just a few of the challenges keeping your boat clean, a nice shine and luster is a challenge. Add to that marine gel coat and paint is very porous and traps dirt, fish blood and salt it is an uphill battle. 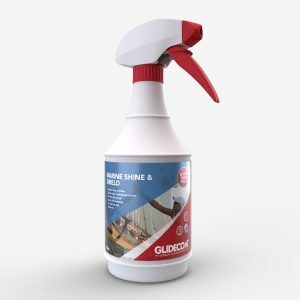 With that Glidecoat has developed a series of maintenance products that can help significantly address those maintenance challenges. Unfortunately, it won’t restore a chalky or crazed surface, but it will minimize damage going forward and for surfaces that are not damaged, help retain that shine and luster. Smart Fabric Protector makes ordinary fabrics and vinyl’s waterproof, stain resistant and easy to clean. The product will help prevent soaking, swelling and rotting on any fabric, boat cushions, marine mattresses, canopies and awnings. Also given our anti-bacterial technology, treated surfaces will kill 99.9% of bacteria. Typically, a Glidecoat treated surface will last 5 times that of conventional water repellent coatings. The product can be sprayed on and should be left for up to 24 hours to get the maximum effect. A typical coating with last 6-8 months in normal conditions. Note: Glidecoat Smart Fabric Protector is an alcohol based product to ensure a much deeper penetration of the active ingredient giving the treated surface much better durability. Please test on a small area of the surface being protected prior to applying. Marine Shine & Shield is a liquid Nano Polymer that has the ability to reflect UV rays unlike wax which still allows the UV rays to pass through and damage gel coat or paint. It also makes the surface hydrophobic so things such as dirt, fish blood and salt will sit on top of the surface instead of being absorbed in, providing the ability to rinse them away with much less effort. Marine Shine & Shield also helps prevent yellow and brown staining from water on the sides of your hull This is accomplished given the size of the nano-particles which penetrate and fill the pores in the gel goat. The product is easy to use and can be sprayed on any gel coat or painted areas along with Stainless steal and plastic moldings. Simply spray the area to be treated and use a micro-fiber cloth or chamois to wipe dry. Marine Shine & Shield can also be sprayed on after a wash and use a chamois to dry off excess water thereby eliminating water spots. To achieve the best results, only apply to a clean surface and the product will provide 4 to 6 months of protection. Repels water, dirt, and salt. 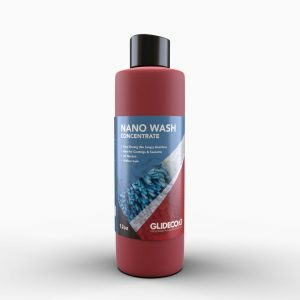 Nano Wash has been formulated specifically for Marine and compliments Glidecoat’s Coating Products. The product produces a high foam content which breaks the bond between the dirt film and your boats gel coat or Paintwork and lubricates dirt particles minimizing surface abrasion which happens with most other boat soaps on the market. Used in conjunction with Marine Shine & Shield or Glidecoat’s Top Coating, Nano Wash will ensure maximum gloss retention through reduced micro-scratching during the wash process.